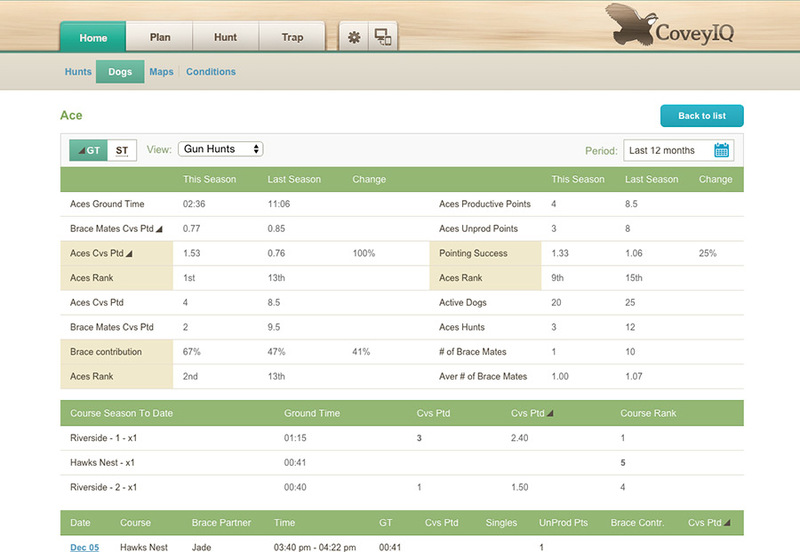 We’ve kept detailed hunting records for years but CoveyIQ makes the whole process much easier and more efficient. Our hunting records are now more comprehensive, and they are easily accessible at any time, which allows us to evaluate course and dog productivity during the season. 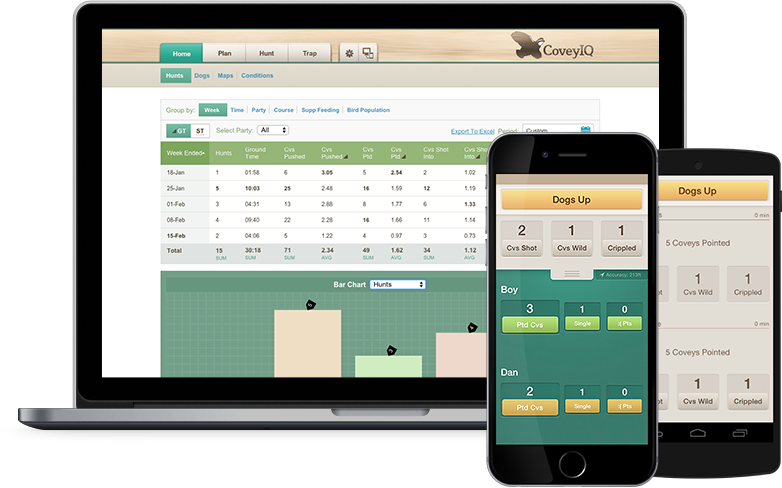 CoveyIQ (CIQ) is designed to help managers better understand the factors that impact wild quail hunting performance through providing real­ time information on areas such as dog and hunt course productivity, covey mapping, and hunt planning. CIQ was originally developed at a wild quail plantation in 2011. Today we’re honored to have dozens of plantations and ranches from Florida to South Texas using CoveyIQ. Over time, the data we’re collecting will help advance quail research. Our apps minimize the time required to log hunt data while using technology to gather spatial, temporal and environmental data. The result is an easy­ to­ use mobile tool that captures a broad range of information on each hunt. To use our apps, you simply need a CIQ user name and password. 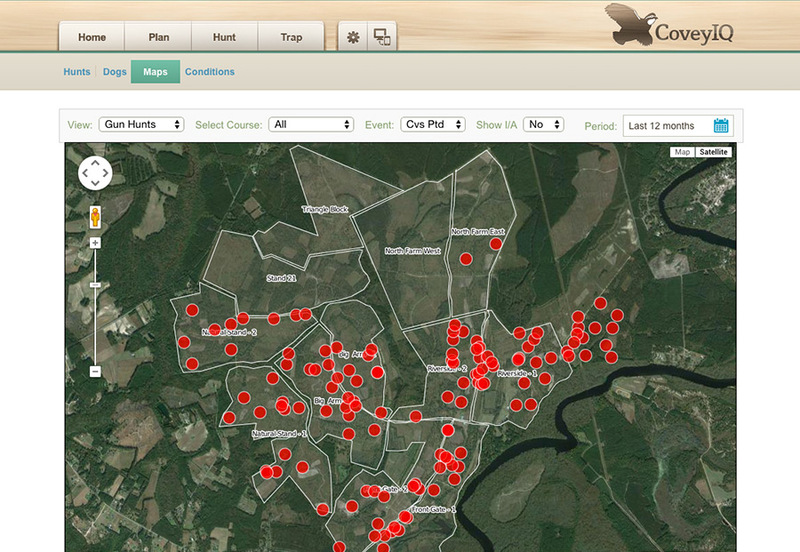 CoveyIQ’s mapping tool allows users to visualize where the coveys they encounter are concentrated. Pointed and wild flushed coveys are mapped in the field and can be filtered by day, season or hunt course. Recently we’ve added mapping tools targeting off season management activities. Much like how professional teams collect and review stats on their players, the dog module provides a complete scorecard on each dog. This tool allows managers to more quickly determine which dogs belong in their string; compare each dog’s performance with their brace mates; and evaluate each dog’s performance the longer they are on the ground. Getting set up is easy and takes less than 20 minutes. Contact us to get started, or for more information please download our brochure below, or send us an email at info@coveyiq.com.